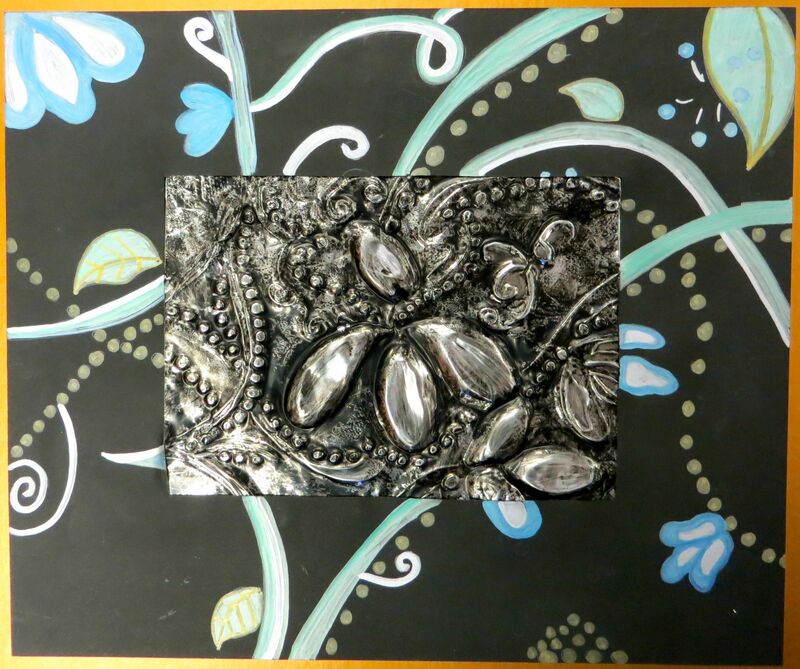 Fifth Grade created these mixed media projects using metal tooling foil and metallic markers on black paper for the mat. Students had to use components of composition and good design in the planning stages. 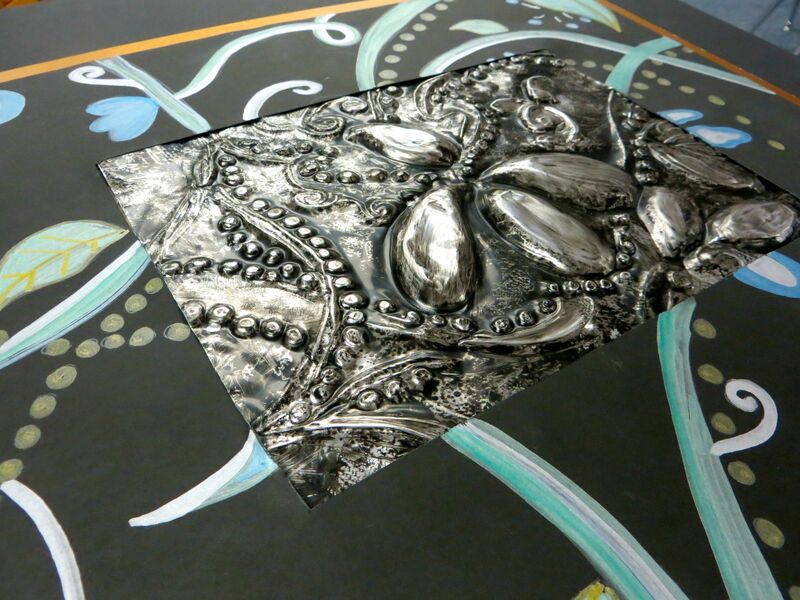 Metal repousse and chasing is a metalworking technique in which the metal is shaped by using tools from the top and reverse side to create a design in low relief. The students were encouraged to create a lot of texture in their piece. Why does my child need an art education? 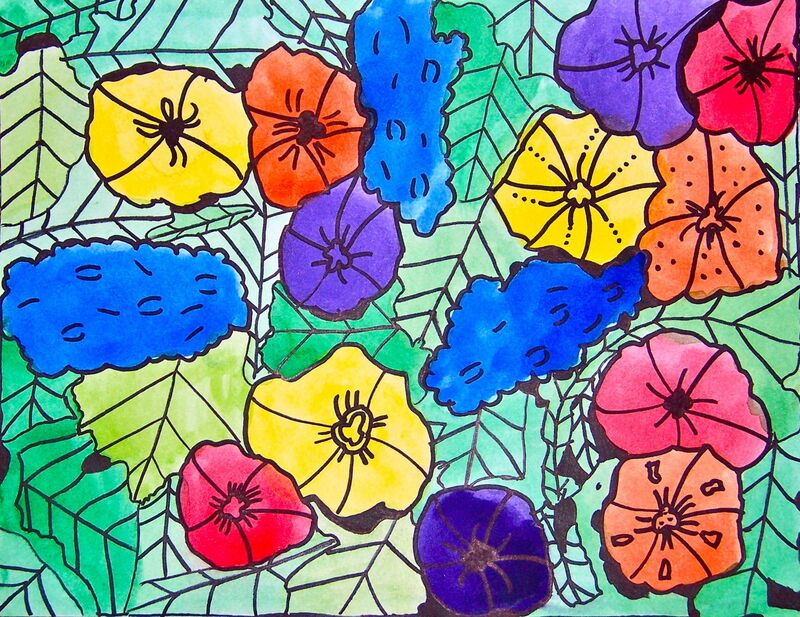 Second grade students painted these beautiful, bright flowers. 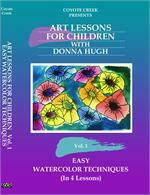 As a jumping off point, we used Donna Hughes video “Art Lessons For Children”. It’s a wonderful video lesson for learning how to use watercolor. Kids learn how to move the paint around on the paper, as well as mix colors. 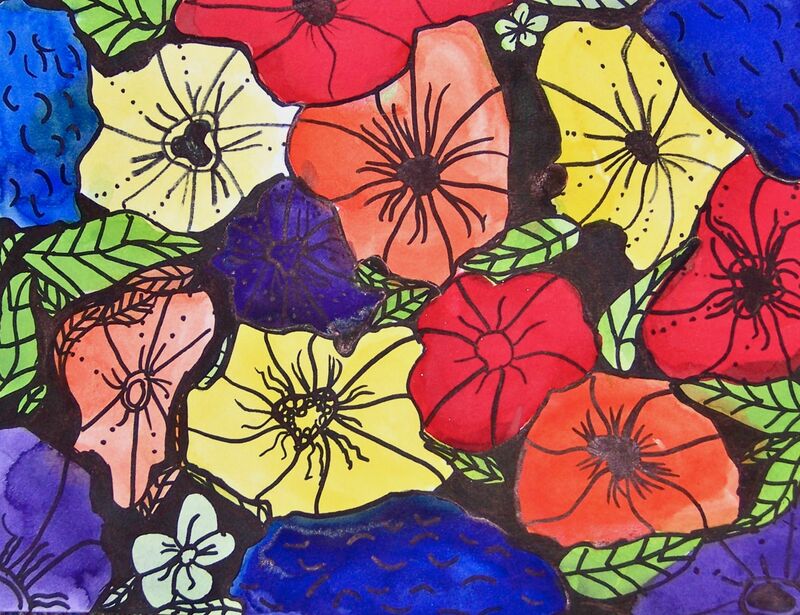 After the paint dries, we draw the details of the flowers with sharpies, experimenting with different pattern and texture. Some of the kids even played with depth by adding black areas. In the past, we sometimes have added shrinky dink bugs stuck on with dimensional foam tape, just for fun. This time we just ran out of time, but I think they are stunning – with or without bugs. This is a project that I can’t take credit for. It’s been floating around the web for a while. However, the process is simple and the results are stunning. I’ve done this project with kids as young as kindergarten and up to fifth grade, as an enrichment sort of project. The timing is important, at least in Colorado. 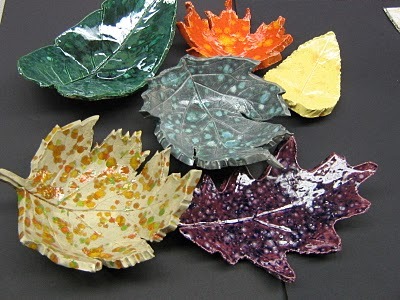 I love to do this project in the fall and ask students to bring in a leaf from home (in a Ziploc bag to stay fresh). But with a class rotation that can go on for a while, it can be tricky getting leaves that are soft and supple before it gets cold and the leaves get crunchy. Have students roll out a slab of clay. I’ve used a red body and a white body clay. It’s just a personal preference and sometimes dicatated by the type of glaze. 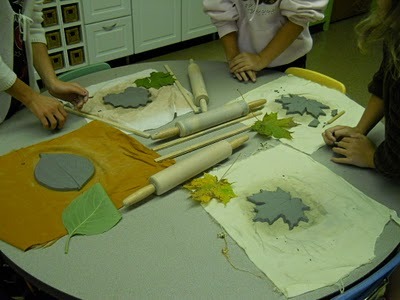 Either the students (or maybe an adult helper, if they are little) cuts the leaf out with a needle tool or a paper clip or tapestry needle. Remove the excess clay and put the prettiest side of the leaf facing up in a bowl. Gently press the clay into the bowl, shaping the leaf. Let dry and remove from the bowl. Fire – I usually use a clay that is fired 04 to 06. 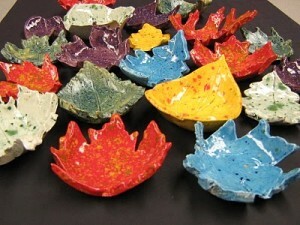 Let students apply glaze and re-fire. Some favorite glaze options: Mayco Elements Chunkies, and watercolor underglazes with a clear overglaze. This is a great line and pattern lesson for second grade students. They love to look at architecture, especially from other cultures. Materials: Watercolor paper, hand outs with architectural elements, pencils, sharpies, liquid watercolor or (semi moist in pans), brushes, salt, saran wrap, sequins, glitter glue flat backed rhinestones, etc. Resource pictures of Russian onion domed buildings. View pictures of Russian architecture, particularly onion-domed buildings. 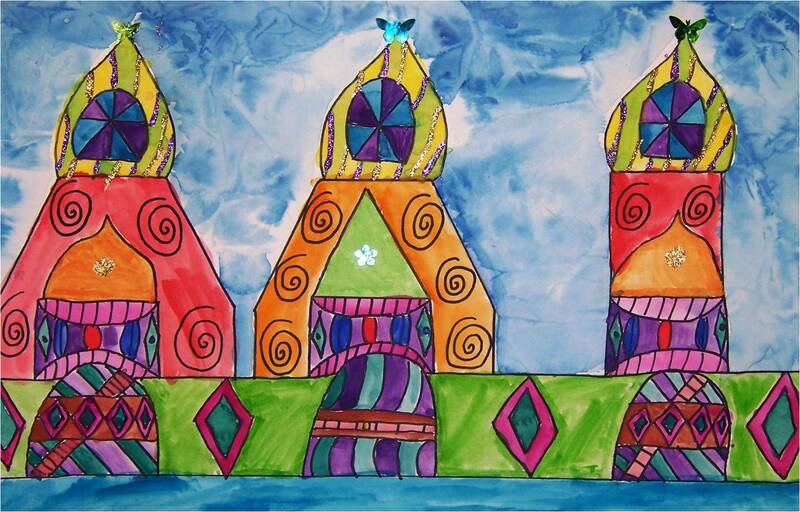 Students practice drawing these buildings on white scrap paper. I demonstrate drawing some of the elements. 2. 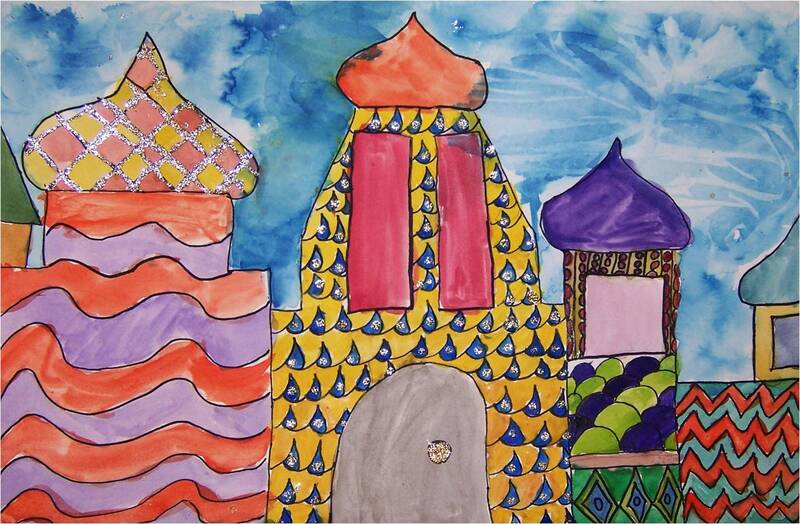 Students now choose a piece of watercolor paper and use a pencil to draw their Russian buildings, filling the paper and incorporating line and pattern into the overall design. 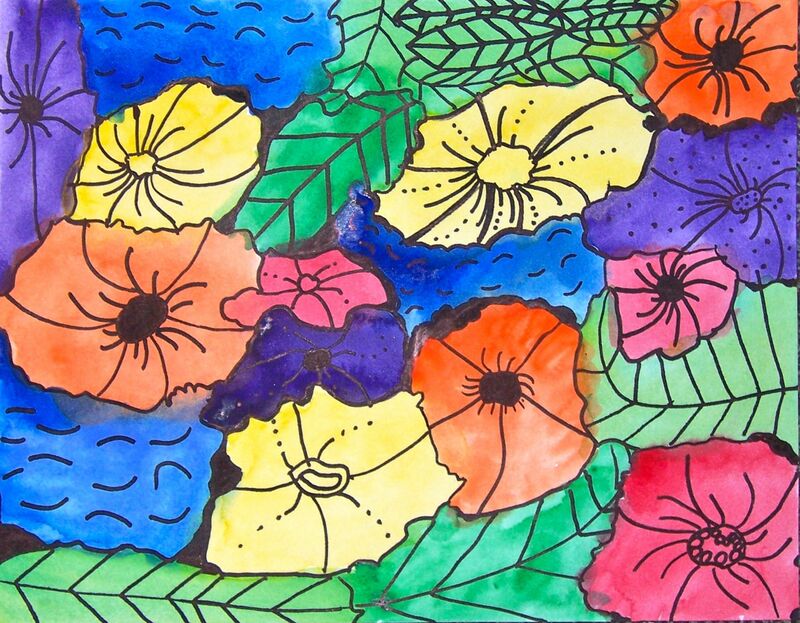 Students paint the background first, using a wet on wet watercolor wash in cool colors and adding texture by laying crumpled saran wrap on top until dry or adding salt to wet areas. Next, students paint the buildings, making sure to use a fairly dry brush (for better control of color placement) to add color to the buildings. I demonstrate jumping around in areas of my paper, not painting next to a wet area. When the paint is finished drying, students can add embellishments such as glitter glue to highlight patterns and gluing rhinestones and sequins to buildings. Most paintings, visual art projects and posts are creations done by Jill Day -2011. When they are not 100% my original idea, I give credit to the source. Educators please feel free to use tutorials/projects to add to your art curriculum. If you wish to borrow an image or post for reproduction, please ask. Unauthorized use is just not cool. Thanks.